Even though the 21st century has now come of adult age, the need for 21st Century skills is more pertinent than ever. Our learners require the skills that will enable them to survive and success in this ever-changing world. Referring to the Framework for 21st Learning and the 4Cs, this workshop will investigate how English teachers can provide the perfect springboard to promote and develop the essential 21st century skills beyond language competence which our learners critically need. We will also look beyond them at the 5th C, Cultural Competence and the importance of different media and content literacies. Reference will be made to National Geographic Learning publications. 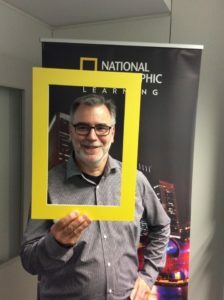 Timothy Phillips, National Geographic Learning representative for Austria, Germany and Switzerland, has been working in the English language teaching world in Germany, Central Europe and South East Asia for over 30 years. He has taught learners of all ages and has been involved in a broad range of projects including use of video in the classroom, the design and development of online learning materials as well as teacher training. Throughout his career he has always been a strong proponent of using relevant and inspiring authentic content to engage learners in the classroom.